"Interactive software programs for whole class teaching in support of the National Literacy Strategy." Learn to type at home with our typing class. Based on the great response we have had from visitors, we're moving our free typing and keyboard games. We've already moved the latest typing game and plan to add extra features (and a few games!) The classic keyboard game is still here plus we've created a new typing game that doesn't show the keyboard. You can still find the advanced game to help you learn how to type: this game allows you to practice using the keyboard in a proper structured way, starting with the the guide keys and progressing from there. As always it is great to hear back from any one playing the games: Let us know if you if you enjoy them. This is a free range of interactive teaching programs (ITPs) designed to support whole class teaching. The web design and development was carried out by Lightness Ltd. 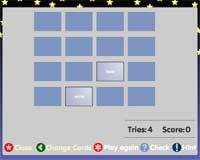 The games may be used with interactive whiteboards or on individual computers. The materials are based around phonemes and include prefix and suffix materials as well as more general tools such as magnetic letters and numbers. A free fully featured version of each application is available online (see below). Here is the free online version of the Phoneme Count ITP. Sort the words by the number of phonemes that they contain. Drag the words into the corresponding boxes. There are 5 levels of difficulty covering 60 words. 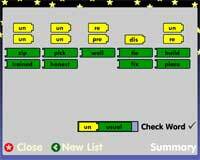 Here is the free online version of the Phoneme Frame ITP. Here is the free online version of the Noun, Verb and Adjective ITP. 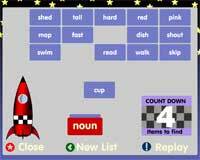 Find five words to launch the rocket. Choose from nouns, verbs or adjectives. Drag the correct type of word into box to countdown the launch. Find five words out of a mixture of fifteen. The words are randomly selected from a list 90 words. 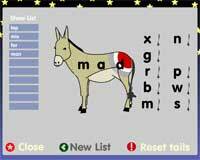 Here is the free online version of the Phoneme Blender ITP. Select from six different combinations of letters. 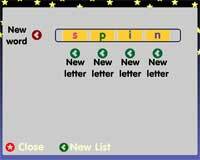 The program then creates a set of spinning wheel with 2 to 4 different sets. The whole word can be randomised or just the individual letters. Decide whether the resulting word is a real word or not. Here is the free online version of the CVC ITP. There are tem word lists with over 100 CVC words. 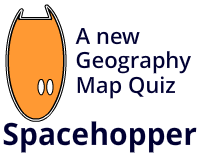 Work through a list of 10 random words and then drag and drop the right tail onto the donkey. The list can be hidden or shown to help students find the right tail. 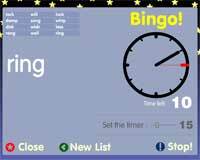 Here is the free online version of the Bingo ITP. This program is supported by a card generator. The actual resource is here. Here is the free online version of the Prefix ITP. There are four list of different prefixes from a total of 160 different words. (drawn from the National Literacy Strategy). Here is the free online version of the Suffix ITP. 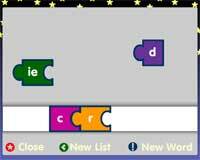 Here is a free online version of the Magnetic Letters ITP.